What is the evaporator's job? The evaporator is one of the 4 parts necessary for an air conditioner to operate. After exiting the expansion device, the pressure drops to an appropriate saturated press/temp that is low enough to pick up heat from the air passing around it. That heat is absorbed into the refrigerant as it boils. 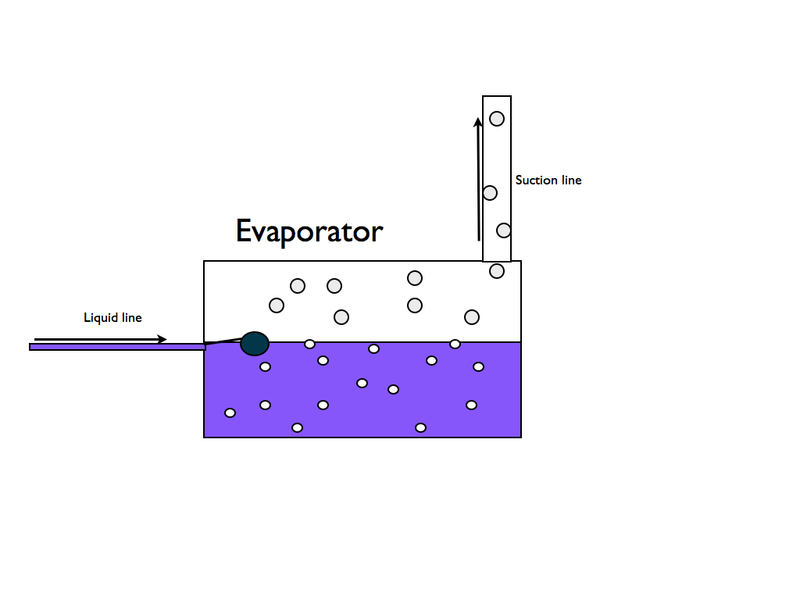 The illustration above is an example of an evaporator. This unit uses a float valve as an expansion valve. As the level in the evaporator drops, liquid refrigerant is allowed in. The compressor is pulling refrigerant gas out of the top of the evaporator. As the refrigerant boils, it absorbs heat from the liquid refrigerant itself. As the refrigerant cools, heat is absorbed from the surrounding air. This type of evaporator is called a flooded type because there is a level of liquid refrigerant in it. This example has a some of limitations. The surface area of the container is small for the amount of heat that needs to be transferred. Most of the refrigerant in the container is not in contact with the walls of the container so heat transfer is less. 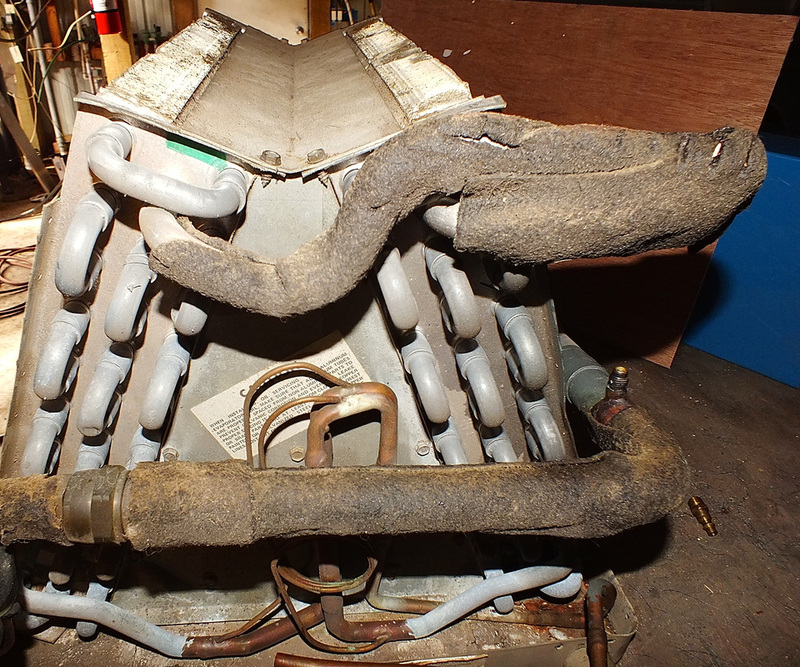 Lets look at some conditions that this evaporator could work under. If the ambient air around it was very hot, this type of evaporator may work ok because of the high temperature difference. (Remember, the higher the temperature difference, the faster the transfer of heat). However, if the ambient temperature were quite low or the container was insulated from the surrounding air, heat transfer would be very low. Under these conditions, the compressor would continue to pump refrigerant gas out of the evaporator. If there is little heat transfer, there will be little boiling of refrigerant. Refrigerant cannot boil if there is little heat to be absorbed. The compressor will keep attempting to pump a more or less fixed amount of gas. The temperature of the refrigerant in the evaporator will then lower with a corresponding drop in pressure in an attempt to boil more refrigerant into gas. This process continues until the temperature gets low enough to transfer the amount of heat through the container walls that the compressor can pump. This concept must be understood to understand how these machines work. 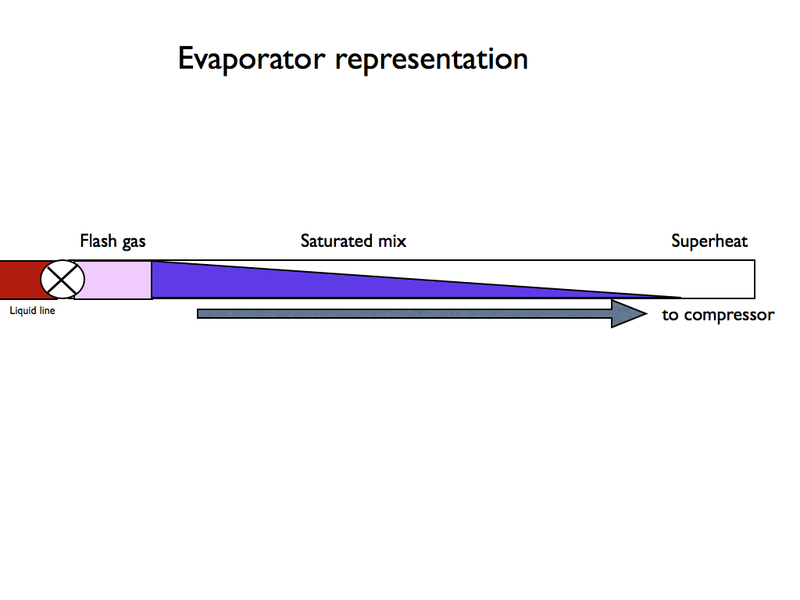 Above is a simple representation of the evaporator. Liquid comes in at the left (red). The circle with an X is the expansion valve that restricts refrigerant flow. The short lavender section is a very short section that drops the warm liquid temperature to a cold liquid. This section removes sensible BTUs from the liquid refrigerant by boiling part of the liquid to reduce its temperature from a warm liquid to a cold liquid. This is called flash gas. There is no cooling of the conditioned space by this section. It is a net loss of refrigerating effect. The long blue tapered section is a saturated mix of liquid and gas that is boiling and absorbing heat from the conditioned space. This section is the part that absorbs the vast majority of the heat from the conditioned space. This mixture of liquid and gas is a specific temperature that does not change throughout the evaporator until there is no more liquid to boil. The all white section at the end of the evaporator is the superheat section. At this point, all of the liquid is boiled away to gas. The gas is still at a lower temperature than the air passing over the coil so it will increase in temperature as it passes through the coil. Superheat is one of the most important measurements we use when diagnosing and charging air conditioners! The video below gives a graphic representation of the evaporator an what happens where. By using small diameter tubing for the refrigerant to travel through and attaching metal fins onto the tubing, we increase the surface area that is exposed to the air passing across the tubing. As the air passes through the air will touch the tubing and fins several times to transfer more heat to the refrigerant inside the tubing. This is called scrubbing of the coil. 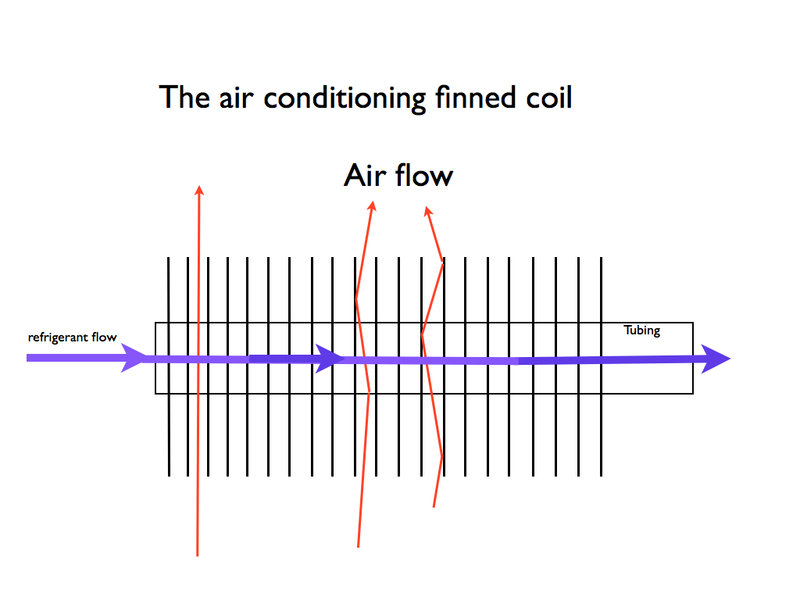 The finned coil is used in the vast majority of evaporators that need to pull heat from air. There are many configurations of tubing fins. On coils that must have the best heat transfer, the fins will be very close together. On coils that need to move more air across, they may be farther apart. Also, some coils may have frost buildup under normal operating conditions and may need more space between the fins for the frost. This type of evaporator is called a direct expansion type because it does not depend on a specific level of refrigerant inside it. Below is an example of a modern air conditioning evaporator. The air passes from bottom to top through the coil. The "A" configuration of the coils is common to make use of limited space in a ductwork application. There are also "W", "H" and slant coils. A modern air conditioning evaporator is designed to transfer a specific amount of heat under very specific conditions. As an example, with R-22, if its pressure is 69# its boiling temperature is 40 degrees F. If the air passing over the coils of the evaporator is 75 degrees F then the difference is 35 degrees F. That is a wide enough temperature difference for the heat easily pass from the air to the refrigerant. If the air is 75 degrees F coming in, the temperature drop across the coil will usually be 18 to 22 degrees F. So the outlet temperature should be between 57 and 53 degrees F. (On newer high efficiency units, this temperature drop may be 14 to 16 degrees F). For a look at how the evaporator is designed check out the video below. 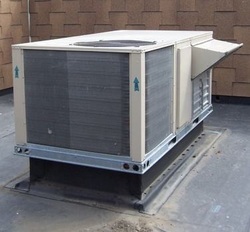 The rooftop unit (RTU) on the left is a package unit. It incorporates all components necessary to provide cooling. This type of unit would not need its evaporator to be sized because the unit comes with it installed. If your unit is a split system, the evaporator must be matched to the outdoor unit by unit size, age and manufacturer. All units made within the last few years are of higher efficiency and all components must be rated for each other to achieve the rated efficiency.